A new national academies report on the integration of the humanities and arts with STEM says that interleaving these disciplines is crucial. 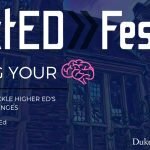 How can Duke better integrate the humanities, arts and STEM? What kinds of teaching, courses, spaces and knowledge are needed? What does true integration of science and humanities look like? How can we continue to build on Duke’s reputation for interdisciplinary scholarship by making it easier for students to learn and work across disciplines? 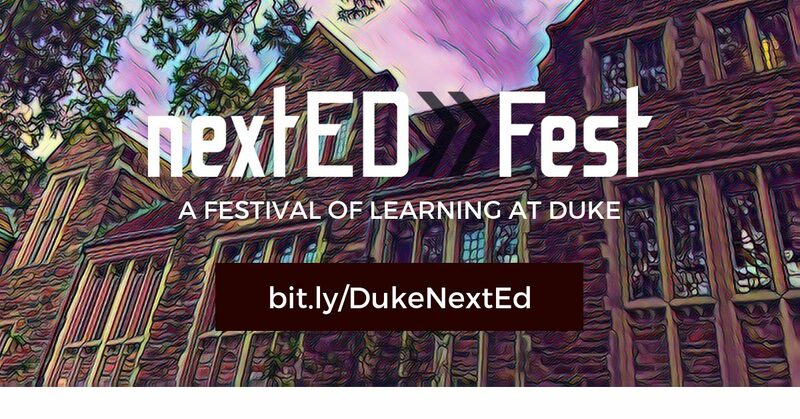 Our panel for the Humanities and STEM at Duke event agreed that there are real opportunities for meaningful interdisciplinary learning experiences —but we still have much to do to create truly deep integrations. 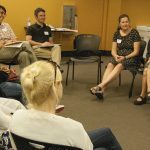 Instructors (especially in courses that pair instructors from two different disciplines) need to pause and consider they way they both teach and advise students across disciplines. Likewise, instructors still find it challenging to help students truly collaborate vs. just assemble the pieces of their independent work. While Duke has a long history of interdisciplinary courses, teaching and opportunities, we need to continue to improve our training and support for instructors, including doing a better job sharing knowledge, documenting stories and providing more practical strategies for success. We hear a lot about robots taking people’s jobs in the future. Joseph Aoun, president of Northeastern University, proposes in his book Robot-Proof that colleges offer a combination of literacies in data, technology and human relations so that students can “invent, create, and discover” and fill “needs in society that even the most sophisticated artificial intelligence agent cannot.” What knowledge and skills will be most important when current Duke undergraduates are at beginning, middle and late-career stages? How do we educate students to be successful and become leaders in the society and economy of tomorrow? What is Duke’s role in the ongoing learning needs of its alumni? Advances in technology and AI don’t mean all jobs will disappear—some new fields will emerge. To be robot-proof, students must develop three key literacies: tech literacy (understanding machines; coding; how they function); data literacy (mastering the products of these machines; massive information); and ‘Humanics’ (focusing on attributes that are uniquely human – that machines cannot duplicate, i.e. creativity; entrepreneurship; working in teams; being ethical; cultural agility). Helping students develop these literacies means faculty must focus on working with students, making them think, create and engage in reality, rather than asking them to primarily absorb information. The time has come for every student and citizen to gain some basic understanding of AI, machine learning and, to some extent, programming. Our speakers suggested AI is the new “meta-discipline”—like writing and/or languages have been in the past. Every student should know more about these issues and have an educated understanding of their complexity. Laws, policies, industries and new technologies will all be informed by AI in the future (and now). Coincidentally, MIT announced a new College of Computing the same week we held our Future-Proof Learning events. Of course, Duke offers many opportunities for students in this space (Computer Science is our largest undergrad major, not to mention the list of co-curricular options such as Data+, Plus DS, and the Innovation CoLab). But we’ll have to continue to rethink and re-invent our approaches and initiatives to stay relevant. The demographics of Duke’s student body have changed greatly over the past 10 years. Faculty and staff may not even be aware of the diverse backgrounds represented. Who are Duke students now? How has the diversity of the student body changed in recent years? How does that diversity, and lack of knowledge of that diversity, impact the everyday student experience? What does it mean to provide an equitable educational experience for all students? What does it mean to truly respect others? How can we help Duke students from different backgrounds understand each other’s perspectives and experiences? Justin Clapp, Director of the Office of Access and Outreach, shared a presentation and assembled a student panel for a discussion exploring student diversity on campus. Duke students with non-majority identities (which could be related to race, culture, sexual orientation, economic background, etc.) said they often prefer to spend their time in what they feel are safe spaces—preferring to spend time with others like them vs. risking the trouble and pain of looking outside those spaces. Students shared some instances of hateful and/or unwelcoming experiences that suggested that many Duke students (and faculty and staff) don’t fully understand or appreciate the diversity and complexity of the Duke student population. We invited Tim Renick, Vice President for Enrollment Management and Student Success, Vice Provost, and Professor of Religious Studies at Georgia State University. He described how Georgia State implemented a series of student-centered and analytics-informed programs, raising graduation rates by 22 percentage points and closing all achievement gaps based on race, ethnicity, income-level and first-generation status. It now awards more bachelor’s degrees to African Americans than any other college or university in the nation. (Watch the full video below). Renick showed us that by first using data and analytics to learn more about your students, you can then implement many small tweaks that end up having a big impact on student access and success. People say, “Think globally, act locally.” Or should it be “Think locally, act globally?” What does it mean to educate Duke students to be global citizens? What do students need to know to function in global careers? Is it language, cultural competency, all of the above or something else? What about how the global affects us locally? What does that look like? 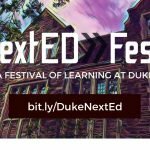 What experiences and curriculum do Duke students need? How do we prepare students to interact meaningfully and respectfully with others locally and globally? And how do we provide that experience to as many students as possible, even if they have reduced means? The barriers for providing more service-learning experiences include: faculty time and finding and developing the right partnerships. Service-learning experiences help students develop resilience. Students also need to continue to be introduced to the principles of ethical engagement with the populations they want to serve. Duke already offers several great resources poised to help faculty and students navigate these issues, including the Duke Office of Civic Engagement and Duke Service-Learning.